Relatives of those who died and survived the sinking of Lusitania 100 years ago to the day were among those who gathered at the ship’s rail aboard Cunard‘s Queen Victoria in the early hours of Thursday 7 May as the ship paused over the site of the wreck, off the Old Head of Kinsale near Cobh in Ireland. 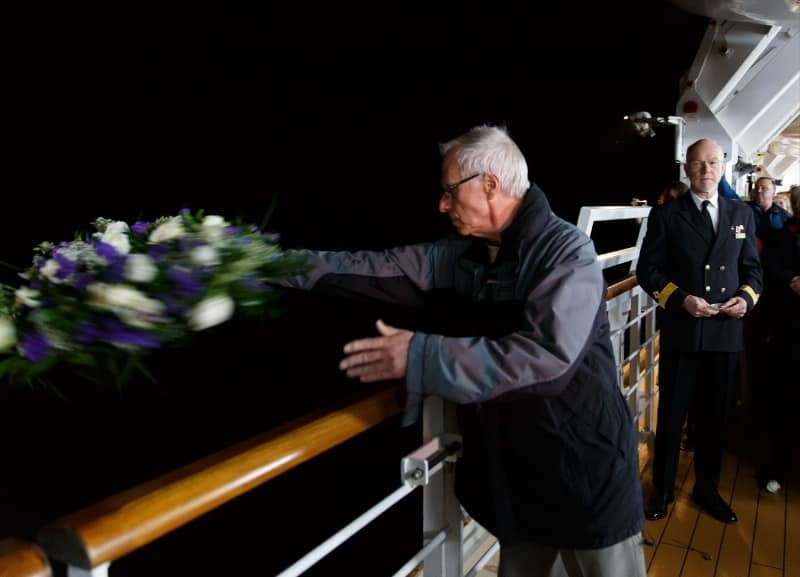 Four wreaths were cast into the sea at a moving ceremony on board before dawn to mark the 1,195 lives that were lost. Other relatives clutched fresh flowers, ready to throw them into the sea in memory of family members lost or damaged by the sinking. Queen Victoria then added her own tribute to those who perished by sounding a blast on the ship’s whistle or foghorn. Cunard’s Queen Victoria arrived in Cobh this morning to pay tribute to the loss of Lusitania 100 years on, and to participate in commemorations for the 100th anniversary of the loss of the line’s flagship, Lusitania, on 7 May 1915. 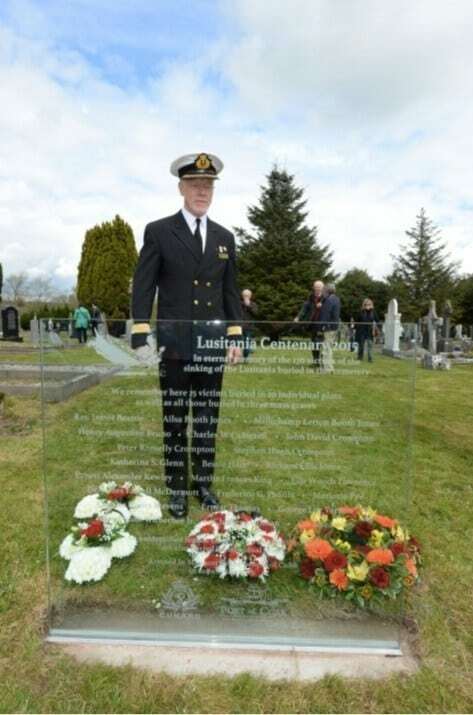 A new memorial was unveiled at the Old Church Cemetery in Cobh, Ireland to name all of Lusitania’s victims buried at the site, including those lying unrecognised in the mass graves, which took place today to mark the sinking of the line’s flagship Lusitania in a tragedy that changed the rules of engagement at sea. At the Old Church Cemetery, wreaths were laid by John Mullins, Chairman of the Port of Cork; David Dingle, Chairman of Cunard; Councillor Alan Coleman, Mayor of County Cork; and Commodore of the Cunard fleet and master of Cunard’s Queen Victoria. Later in the day, a moving memorial service was led by Irish President Michael D. Higgins who arrived with a full naval service guard of honour to lead a service to mark the loss of the Lusitania exactly 100 years ago. British Ambassador Dominick Chilcott, US Ambassador Kevin O’Malley and German embassy Charge d’Affaires Wolfram von Heynitz also attended the service. Blasts on Queen Victoria‘s ship’s whistle marked the time exactly 100 years before when Lusitania was hit (2.10pm) and when the ship sank just 18 minutes later (2.28pm). Music interspersed readings given by John Mullins, Chairman of the Port of Cork, and David Dingle, Chairman of Cunard. A moving survivor’s account of the disaster was read by Commodore of the Cunard Fleet Christopher Rynd, before wreaths were laid at the poignant Lusitania Peace Monument in the town square. Four glass memorial walls were also unveiled today in the churchyard above the town of Cobh, Ireland, where many of those who lost their lives in the Lusitania disaster exactly 100 years ago lie buried in mass graves.